Limited sun to light showers. Highs in the 50s. Overnight Thursday: A few showers, areas of fog. Lows in the 40s. Friday: Showers to some sun and quite mild. Highs in the 60s, 50s north. A boundary between that cold air that has been here for weeks and a new batch of warmer air is now north of New England. The boundary is close enough that a bit of rain arrives this afternoon and overnight. Weak high-pressure is here with mild and dry air to start out, but we have thickening clouds and a chance of rain shortly after lunchtime. Rain may be moderate at times by evening, with temperatures in the 50s. 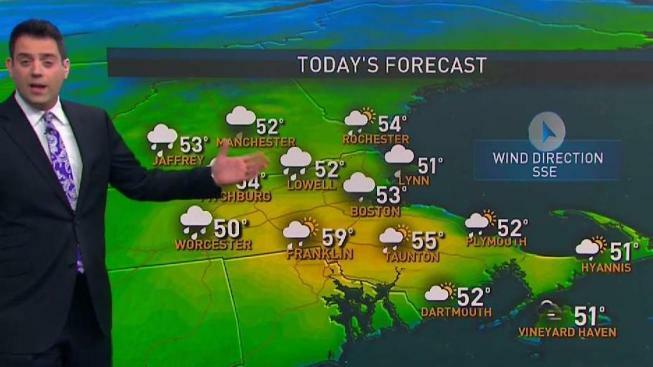 This is the first all rain event in New England since late February. Rain should shut off for a time tonight with temperatures holding in the 40s. A vigorous front crosses New England tomorrow with gusty wind and showers — possibly a thunderstorm. If there is enough sunshine in eastern New England we may touch 70 degrees. Otherwise, temperatures will reach into the 50s to the low 60s before cooler air comes in late. Wind from the southwest gusts past 30 mph, shifting and becoming more from the northwest 15 to 20 mph with cooler and drier air late in the day. Another strong low-pressure system tracks near the Canadian border Saturday with a mixture of sun and clouds, then wind will increase once again. High temperatures will reach into the 30s to 40s north, and 50s south on Saturday. Saturday night features strong wind, and rain showers south, some snow squalls in the mountains. Easter sunrise service looks pretty cold with a chance of rain, snow showers or a squall. The front should race offshore, with any mountain snow, or southern showers ending for sunshine Easter afternoon. Temperatures will hold in the 30s north, 20s in the mountains, to the 40s and maybe some low 50s in southern and eastern New England if we get enough sunshine. The same boundary is still nearby early next week with a chance for more rain or snow by Monday night and much of next week. Though we are enjoying much warmer weather for now, there are signs that we are not quite done with the snow and cold just yet.